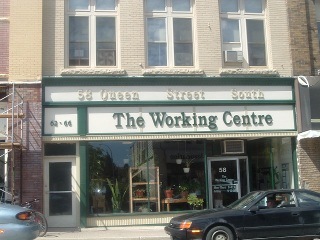 The Working Centre is a Kitchener-based not-for-profit community organization that helps people in a variety of ways: job searching, refurbished bikes, community kitchen, thrift shop and computer recycling. We hosted the Kitchener Software Freedom Day in 2008 and 2009. Date: September 17th, 2011 - 10:00am until 4:00pm. Thank you to the 45+ people who showed up for the presentations, disc give aways, and the install fest. Special thanks to Bob, Paul, Raul and Stefan for presenting. And thank you to the volunteers who helped keep Computer Recycling populated during the presentation times. Our event was a little more than half the size of our 2009 event (which makes a lot of sense since the entire Working Centre was open in 2009 and many of the people who came through were not visiting just for Software Freedom Day). Despite the smaller crowd the event seems to have been a success, we installed Linux on a couple of systems, and had a lot of questions for the presenters. Computer Recycling still has a number of burned Ubuntu Linux CDs and DVDs to give away. If you didn't make it to Software Freedom Day, but still want a Linux CD/DVD, please come down and get one from us. Video was taken during the event. We haven't had a chance to review the video yet, but heard some of the video was quite dark. We still plan to put the video (or at the least audio from the video) online. Some photographs were also taken by an independent photographer. We're working on getting the photographer to put them online for everyone to see. [slides in LibreOffice] format from Charles' XBMC presentation will be available later in the day Sept 20, 2011. Location(s): Presentations will be at the back of the Queen Street Commons at 43 Queen Street. For the install-fest and CD/DVD giveaways please goto the Charles Street entrance of the 66 Queen Street building and follow the sign down to Computer Recycling. Charles, from The Working Centre will present XBMC. Open source isn't just for geeks! Paul will introduce the world of free culture: music, movies, clip art, and other resources that you can share and build upon. Raul did a couple of wonderful presentations at the Software Freedom Day in 2009 and has confirmed that he'll be presenting again in 2011 and sticking around to answer questions and help with the install-fest. Bob, also from The Working Centre, will talk about the basics of Linux. Stefan is a wonderful photographer who uses Linux and free software for the majority of his amazing work. Stefan will talk about using free software to develop photographs. We are actively looking for volunteers who can help with the install-fest, who want to prepare materials about free software, or talk about using free software.We will also need volunteers to help with setup, takedown and logistics on the day of the event. Call Charles (519)743-1151 x121, email: cr @ theworkingcentre.org. 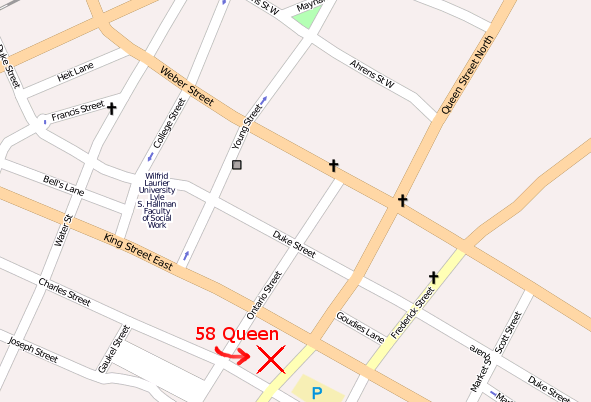 (or visit in person @ 66 Queen Street South, Kitchener, Ontario). The following people and organizations are helping make Software Freedom Day a reality. The Working Centre for hosting the event. The Kitchener-Waterloo Linux User Group for providing speakers and volunteers.